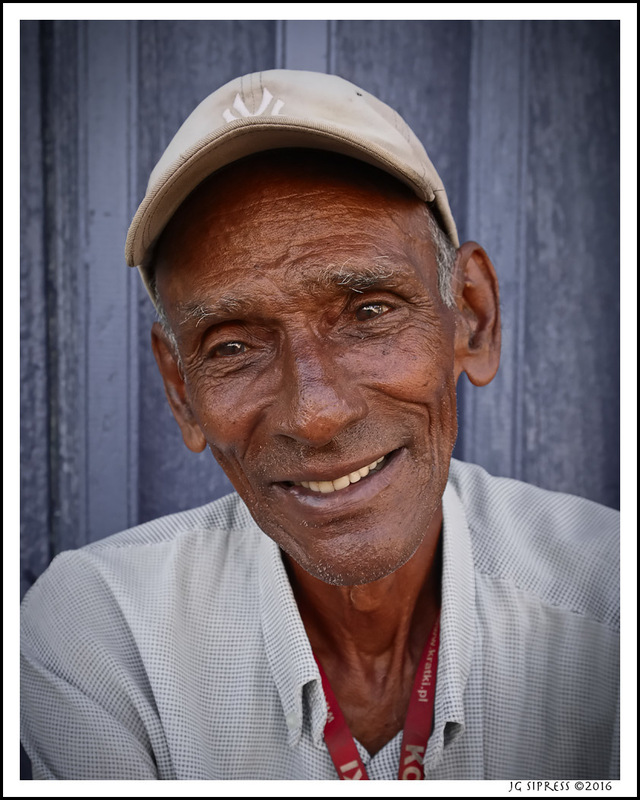 Another person I met in the neighborhood of Trinidad, Cuba. Jeffrey, thank you for sharing these three portraits. They are good, really good. Of the three this is may favorite, mainly because you well captured that simple and genuine smiling expression which is very telling of the personality of the subject. I also like that, while in color, this is not distracting. In this respect, I think the choice of a naturally neutral background helped quite a lot. The only criticism I have is that, for my taste, the head is placed too high in the frame. I would be tempted to crop the lower 1/6 of the image which would not only position the head more centrally but also reduce most of the red ribbon around the neck thus further reducing color distraction. Thank you for viewing and commenting, Marco. Agree with the distracting lanyard around his neck. I cropped a good bit already to minimize it, but can do more. That was a problem with many people I photographed down there.